With kind support from Edmund Edgar I have been experimenting with the “Demo Object” in SLoodle, which is a stub or template for developing customised objects in Second Life or OpenSim which can connect with a corresponding module in the Moodle VLE. The Moodle “demo-1.0” module is in the standard SLoodle distribution – I am using version 2.0.10 alpha. And can be found in mod/sloodle/mod/demo-1.0. The object_definitions/default.php script should be altered to “show” the object in the inworld Rezzer. Note that if you have syntax errors in an object definition file or extra whitespace outside the PHP brackets, lots of things will break. which deals with setting up communication with the server, and sends linked messages to any other scripts in it with information about the Moodle server it needs to connect to, and any other configuration parameters it might have. Into this object, two scripts should be placed. One is obtained from …/mod/sloodle/mod/demo-1.0/sloodle_mod_demo-1.0.lsl The other is a generic script and can be obtained from …/mod/sloodle/mod/set-1.0/sloodle_rezzer_object.lsl. These are the base that can be used to create a custom module. Set the permissions of the in world object and its scripts as appropriate and then take a copy into inventory. Drop that object into the contents of the inworld SLOODLE Rezzer. You should now be able to use the Rezzer as normal to select an appropriate SLOODLE controller and scene, and then under “Other” objects you will find the “Demo Object” which you can add to the scene. After it rezzes in a default position close by the Rezzer, reposition it where you want, and then hit the “Freeze” button on the Rezzer screen to sync the current position of the scene objects. 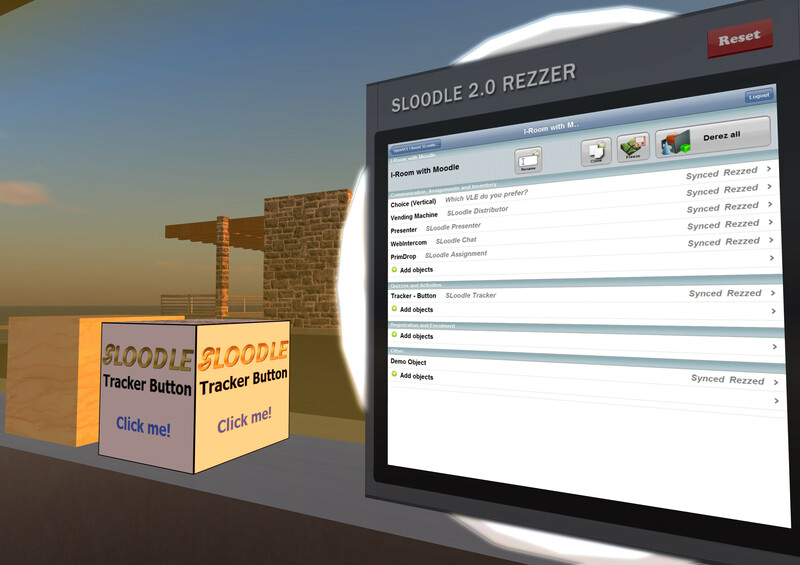 There are some other objects in the SLoodle kit which can also act as guides, such as the “SLOODLE Tracker Button” which when clicked in world communicates with a Moodle module and gives a message back. At the time of writing I have the SLOODLE Demo Objects rezzing from the SLOODLE Rezzer, but don’t yet have Moodle responding through it. Testing continues.